Every year, more than 100,000 track and field fans flock to the University of Pennsylvania’s Franklin Field at the to attend the Penn Relays – a three-day track and field carnival that hosts nearly 20,000 runners at all levels of competition. Now in its 122nd year, the Relays have become a Mecca to runners and running enthusiasts alike, showcasing the world’s top athletes on the cusp of their spring and summer competition schedules. On Saturday – the premiere day of the Relays – one race stands out from the rest: the Masters Men’s 75-and-older 100m dash. Run since 1989, this event has become a crowd favorite at the Relays. It interrupts the Saturday schedule of top collegiate and professional races to showcase what many consider the “essence” of running: the pure joy of competition. 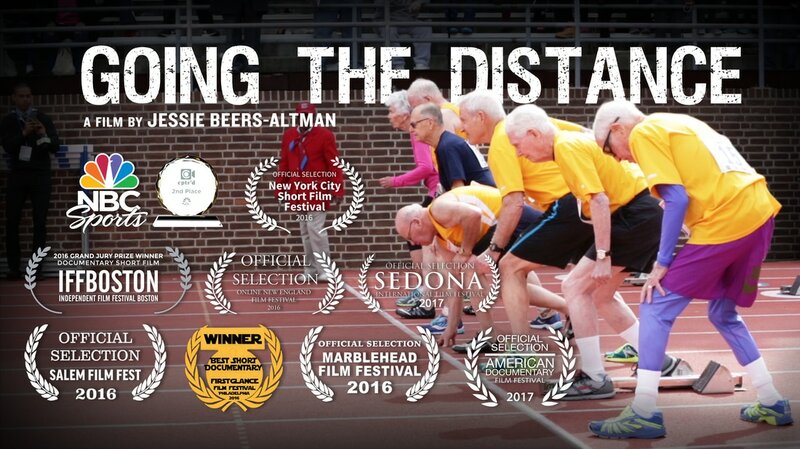 Going the Distance profiles three runners in the 2015 event: Champ Goldy (age 98), Ed Cox (age 88), and Betty Leander (age 86). The film depicts not only the event itself, but also the spirit of youthfulness behind the race. The runners embody the ideas that you’re only as young as you feel... and that age is just number.